It was All Hail The Queen when Helen Mirren one, and now we have the King. I have so much I could say about Oscars ( most boring red carpet ever except for Cate Blanchett, bless her daring heart) but since so much has already been done and overdone, I'll give a little props to one of my fav actors Colin Firth as my Oscars contribution. In case you were wondering where Colin got his glow ( besides that statue) he was prepped with skincare by Kyoku for Men . I don't know about you but I think some of these products might be ones I could use for myself. On a side note, as she did last year Colin's lovely wife did a recycled/repurposed dress as part of her eco challenge. I thought she looked beautiful if maybe a bit too wedding dress-ish. I posted on her Vogue UK blog here last year and it's still up and running this year with great behind the scenes pics. “When I’m grooming someone for the red carpet, I never have a lot of time, so my main goals are to plump, hydrate and increase blood circulation in the skin to allow a natural glow shine through. Massaging products into the skin really thoroughly and using a pressing motion for application are both great ways to increase blood circulation and let color to rise to the surface. To prep Colin for the Oscars, I started with Kyoku for Men Razor Repair Balm, which contains witch hazel and aloe vera, to combat post-shave redness and calm his skin; it’s a great anti-inflammatory product, and I always keep it in my kit for emergencies! Then, facialist Natalie Eleni applied the Kyoku for Men Eye Fuel to Colin’s Eyes using lymphatic drainage movements (using your ring finger, gently pat around the orbital bone in an outward motion towards the ear), which are great for re-energizing and de-puffing tired eyes. I love the Bronze Goddes collection each year from Estee Lauder. First of all because all the bronzes and golds are perfect for me and of course there's the re -release of the Bronze Goddess fragrance. They always add in some new items to love and this season it's new Bronze Goddess Soleil fragrance ( read my review at Beautystat here ) and the also new Bronze Goddess Sea Star Bronzing Blush . Not only is this super pretty , it's also very wearable. The colors will suit most anyone ( only a tiny bit of overspray here by the way) . 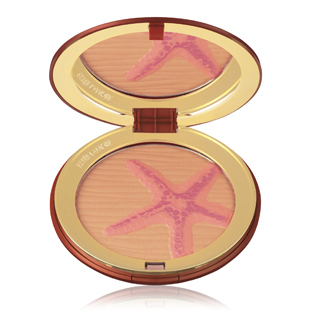 The bronze is not deep but a soft medium shade with light pinky peach in the starfish. It looks glowy and warm on . As the name says it more blush than bronzer but can be used as both. 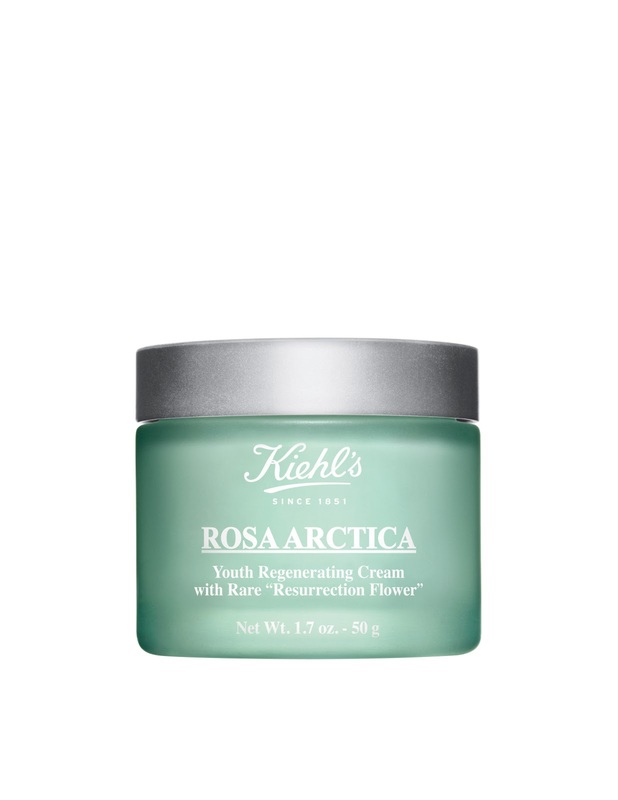 Kiehl's Rosa Arctica is the cream to reach for if you have winter dry or desert sun parched skin. It's loaded with moisture from cocoa butter, shea butter , fatty acids, squalene and glycerin. Kiehl's new key ingredient here is the Resurrection Flower, a plant indigenous to Bulgaria , that is know to survive in the harshest condtions. The flower itself can survive periods of dryness ( and completly dry out) for up to 31 months, according to Kiehls, by miminizing water loss and then come back to normal growth and flower after moisture is once again added. All this means that this new ingredient is said to "jolt" skin cells , wake them up, and help to reduce wrinkles, increase elasticity and smooth. That's the scientific speak. 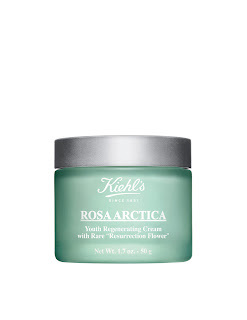 What I can tell you from trying it, is that Rose Arctica cream is a thick , silky cream ( you can tell there is shea butter in there) that obviously is super moisturizing. It is the richest cream in the Kiehl's lineup. It sinks in fast and is soft not sticky on skin. It's far too heavy for me, but as I said in the beginning, if you have super dry skin this is exactly what you are looking for. Think of this as like the heavy hand cream you use but made for your face with anti-aging properties. Retail is $ 60.00 for 1.7 oz jar. I look forward to the Pamella Roland show each season. I know I'm in for procession of beautiful dresses and gowns and am never let down. 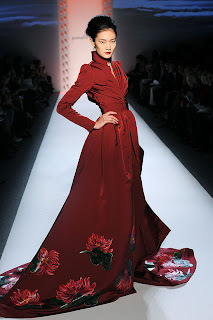 Her designs aree simply made for Red Carpet wearing and this long sleeved kimono gown is one I would love to see someone rock come this Sunday's Oscars. There are trousers underneath, which I am not into, but otherwise this is so gorgeous and on most stars the long sleeves would be unexpected. However, with the cold temps in LA , some celebs might be thinking long sleeves are the way to go. Another favorite of the show was this short cocktail LBD. It may be a Little Black Dress but it's far from boring. This is Oscar After Party ( or any party)wear. 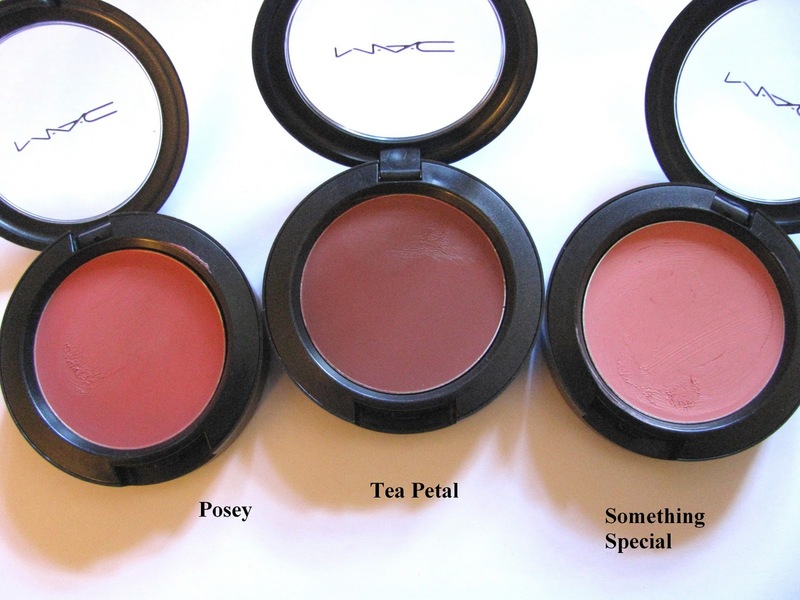 Cremeblend blush is back to be added to the MAC permanent line after a brief appearance in the Lillyland collection. These new shades are made to be skintone matching, good for contouring( the deeper shades ) and to give skin "glow". They are very creamy with a lot of slip and blend easily. Shades in the pot are darker than what ends up on skin and they can be blended down softer or re-applied for deeper color. Cremeblend blush is also highly emollient with mango seed butter , shea butter and olive fruit oil. But even though they are super creamy, once on skin they dry down nicely but do not feel dry. I wouldn't recommend them for oily skin, but those with normal to dry, especially the drier skins who have trouble with powder, should give these a try. Posey, Tea Petal, Something Special. South Seas pearls are a treasure and Kailis is an Austrailian family owned company, who harvest these gems from their own beds located in Broome, Western Australia. To commemorate and celebrate Oprah Winfrey's final show season and her visit to the country , Kailis has designed a special pendant and charm just for the occasion. Now whether you are an Oprah fan or not, you can still appreciate this beauty. The O medallion has an inner, separate circle with the inscription " Oprah, The Farewell Season. However, this is not highly visible and not easily seen. 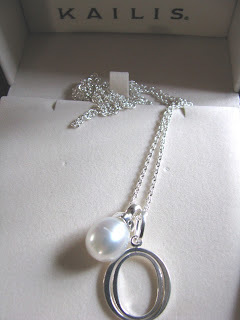 What you do see is a very modern piece of pearl jewelry. This is not your grandmom's jewelry . It's not fussy but carries that inherent pearl elegance. I love pearls and love how just right this looks . It's almost casual. The pendant is sterling silver and has a glowing 10-12 mm baroque South Seas pearl with 2 tiny black diamonds tucked into the bale on 2 sides ( a trademark of Kailis, they call it their "secret black diamonds" ). Each charm can be worn together as shown or on it's own. The chain is long at 90 cm or approx. 34 inches. There you can also hop over to the main site and read more about the pearl harvesting etc, which I found really interesting. Nexxus wants to mends your ends. Your Split Ends that is. Their new Pro Mend line is a multi product line specifically to deal with those pesky split ends. 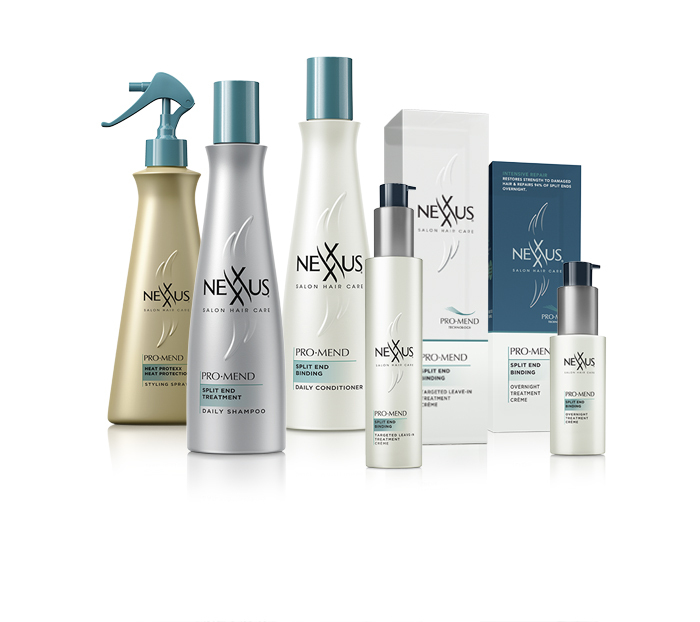 According to Nexxus, 92 % of split ends are repaired in one use. I don't have much in the split end department, but I found the shampoo/conditioner combo to be smoothing . My hair came out shiny, clean, soft and conditioned but not overly so. I didn't try the individual treatments, but I am a fan of leave -ins, so if you need help in this area, it's worth a look. NexxusCreative Director Kevin Mancuso says “While maximum split end repair can be achieved when the ProMend products are used together as a system, women can mix and match based on their personal hair care needs and still see noticeable results"
- Nexxus ProMend Split End Treatment Daily Shampoo: prepares split end prone hair for repair by gently cleansing away damaging impurities and build-up, while providing the vital nourishment hair needs. - Nexxus ProMend Split End Binding Daily Conditioner: works to target and bind 86% of split ends back together in just 3 washes for healthy, strong hair. -Nexxus ProMend Split End Biding Targeted Leave-in Treatment Crème: targets split end problem areas and binds 92% of damaged ends back together in just one use. -Nexxus ProMend Split End Biding Overnight Crème: works overnight to bind 94% of spilt ends back together in just one use for dramatically stronger, silkier hair. At long last I have found a lip stain I love and will use. The new Aura lipstain from Hourglass. Aura is the name of two new products from Hourglass- Cheek Stain and Lip Stain . What makes Aura Lip Stain so great ? First, has a lot of pigment . It's not sheer,( despite shades being described as such) but has at least what I would call medium coverage. It looks more like an actual lipstick on. Next, it's not as drying as those I've tried before. Yes it's still dry, but not drying. I do end up prefering to apply some balm over it but it looks great on it's own. Third, it's not matte . It has a little pearlescence to it. Lastly it's blendable. It lasts quite long, I went about 3 hours with no fade at all and then had dinner ,after which there was still the tiniest bit of color there. 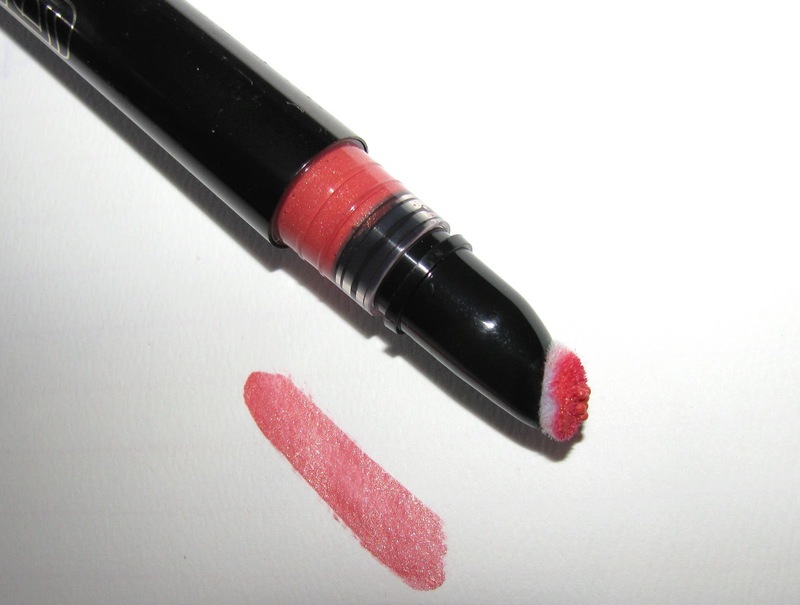 The shade shown in both lip and cheek colors is Petal. The new cheek stain was among the products used by Hourglass Beauty Director Michael Pierce on some legendary models like Carol Alt and Niki Taylor at the recent Adrienne Vittadini show during New York fashion week. Irina Shabayeva has done a capsule collection for the INC brand at Macys called Irina for INC. It encompasses form fitting dresses, lightweight Spring jackets as well as shoes. Colors are often bright with touches of black and the fabrics soft jersey . I particularly like the anoraks. They were high fashion a few years back but are really always in style and great for the mid weather days of sun or rain when something light is all you need. It's a little military looking and little urban jungle. According to Macys the collection includes 13 full looks: dresses and separates with two platform styles of shoes (Mallorca available in black & ecru and Mallory in pink & gold). Tops range in price from $49-$99, pants & denim range from $79-$129, skirts from $89-$119, dresses range from $99-$169 and outerwear from $119-$159. Footwear will be available at $98. 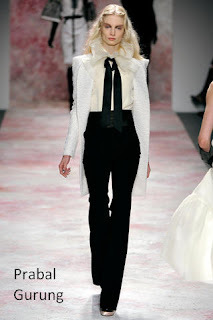 In watching many of the shows this just passed New York fashion week for Fall , I noticed a trend sneaking out. The tuxedo. Not all the looks are traditional tux but all seem to have ties , jackets and often a nod to the 70s or 80s. 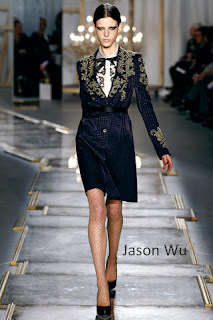 My favorite here is by Jason Wu, his show might have been the best of the week. I think this can look spectacular on the right person but you need to be able to really work it. Would you wear the Tux look ? Did you in the past? 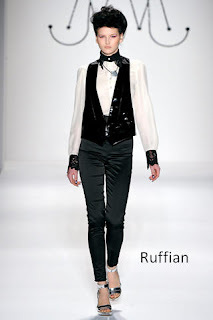 I seem to vaguely recall a tux like blouse I had in the 80s as a youngster. But really, I'm not sure. Today is the day Lady Gaga's newest for Viva Glam hits stores . 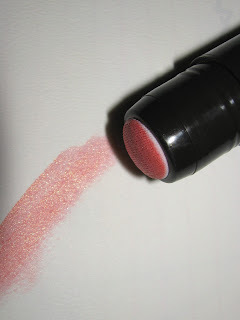 Viva Glam Gaga 2 is LE but will be in store displays for one year. 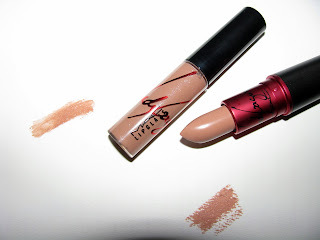 The lipstick is an Amplified and more beige and flat than the gloss. It's very muted and would especially make a great layering color to tone down too dark lip shades . The gloss is my pick of the two. Usually I love lipsticks but the gloss has a pink base and really looks great on. Both are very neutral and easy to wear. The Mom who usually wears only light pinks/peaches and is a medium skintone, light blonde tried the lipstick and it looked amazing on her. She rarely reaches for nudes and I'm glad she went for this. 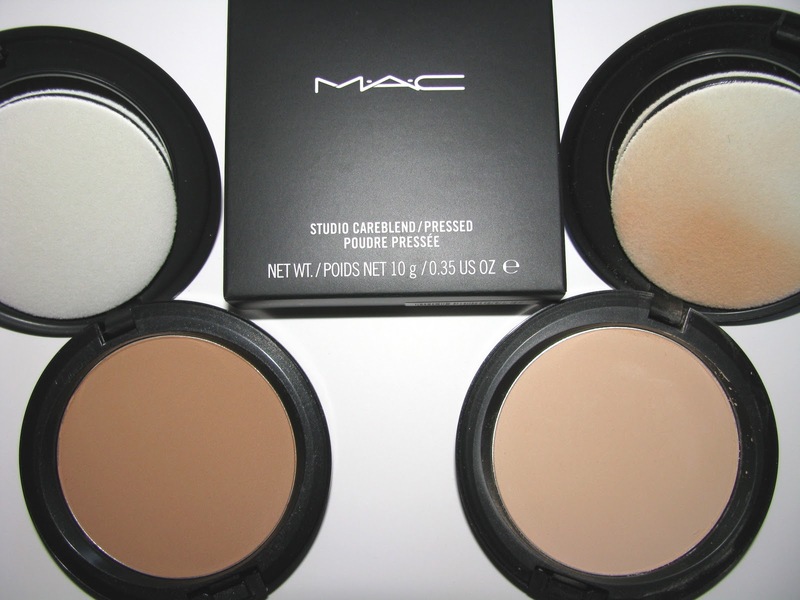 MAC has created a powder for the powder phobic, and those with drier skin. New Studio Careblend Powder not only has Shea Butter in it but also Safflower Seed Oil, Meadowfoam Seed Oil , Olive Oil and Lecithin. The powder still applies mostly like a normal powder, it's smooth and a bit more blendable than most powders, is silky but not creamy. It also looks like powder when applied, but not heavy and not dry. It blends into skin and gives a very finished/perfected look and provides excellent medium to full coverage . As I said, Careblend is great for those with fear of powder. Anyone with drier or mature skin who has wanted to use powder but is afraid of it being too dry, or settling in lines , should give this a try. I personally love powder and with my oilier skin, the more matte the better. 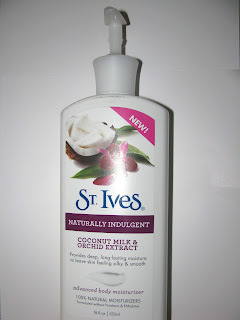 All the moisturizers in this make it not for me for the exact reasons it's great for normal-dry skins. But I am loving the look this creates when applied. It can be used on it's own or over makeup. Studio Careblend Powder comes in 6 shades. Shown in my image are Medium Deep and Light. Launch date is February 17 and retail is $ 23.00 ( part of the Future Face collection). My review of the new Annick Goutal Spring beauty Le Mimosa is up on Beautystat here if you're interested. It's the newest in the house's soliflore line. Lady Gaga debuted a new yellow nail shade last at the Grammys. It's by her longtime nail artist Deborah Lippmann and called Yellow Brick Road. It's due to be released on April 15 and is a jelly finish . I love yellow nail polishes , especially for summer, so I'm into this. But it's not a shade for everyone. How about you? Would you buy/wear it ? Summer looks to bring a new MAC lipgloss called Glamgloss. It was used yesterday in the Behnaz Sarafpour show. MAC says it will be released in Summer 2011. No more details but you can get a bit of a peek in the images. The Glamgloss shade is What Comes Naturally along with Tanarama lipstick over lips. New MAC products got a preview at the Fall shows this weekend. At Jason Wu's Fall 2011 show Saturday ( featuring some of the prettiest clothes of the season thus far), cream eye shadow in Smothered was used on the lids, and is set to debut in Autumn/Winter according to MAC. MAC artist Diane Kendal also used on the eyes MAC Pro Ultra Marine Chromagraphic pencil blended over eyelids and lower lashline as base. Thru The Night Pro Longwear shadow and Carbon eyeshadow was blended over the creamy base for a smoky intensity through the inner and outer crease. Also new for fall will be Runaway Red Lipstick. Seen on the models at Peter Som and Diane Von Furstenberg. For the red fans and collectors , it looks a beauty. Gucci Westman not only Revlon's global artistic director, but also wife of Rag and Bone's David Neville, as usual did the makeup for their recent show. The look was called " Urban Eskimo" and featured ruddy cheeks and skin that looked a little sun or wind burnt. All products used were by Revlon. Cheeks were done with Cream Blush in Berry Flirtations. The inner rim of eyes had Revlon's Luxurious Color Eyeliner in Black Velvet, blended with Illuminance Cream Shadow in Wild Orchid along with Matte Eyeshadow in Rich Sable across lids and underneath the lower lash line. Nails were a steel colored grey called appropriately Steel Her Heart and done by Jin Soon Choi. Need to escape to the tropics but can't exactly do that right now ? Well how about some exotic frangipani monoi to get you smelling like the tropics? Somehow, despite my love for many things Elemis, especially the other Frangipani Monoi products, Moisture Melt and Bath and Shower Cream, I had no idea there was a matching body balm. Mon Dieu. Called Exotic Island Flower Body Balm , it has the same delicious scent as the rest of the line. A scent that is tropical, full of white flowers , a little coconut, a little gardenia and whisks you away like Calgon, only better. It really is hard to beat the fragrance in this. The balm itself is not too thick even though it's called balm. It's a thinner formula the dries fast and as I've said, smells amazing . The scent lingers for a little while but not too long. Ingredients include "pure extracts of hydrating Marigold and soothing St. John’s Wort " with an oat milk base as well as hand-picked Jasmine, Ylang Ylang and Osmanthus . Winter brings hat hair. We have full hair, then we need a hat and soon it gets a bit smushed. I like wearing hats and have some many nice ones. Don't like hat hair. This winter I decided to fight hat hair by adding some volume products to my routine. And I gave the volumizing line by one of my favorite brands, Phyto a try. 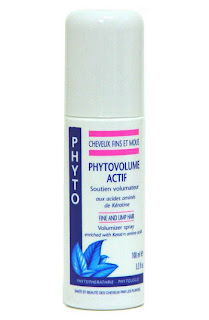 They make amazing haircare and their Phyto 7 Daily Leave In Hydrating Creme is a staple and one of the best I've used. 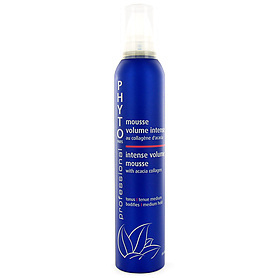 Phyto's Volumizing line consists of Phytovolume volumizer shampoo,Phyto Intense Volume Mousse, Phytovolume Actif volumizer spray and Phytodensium mask. I didn't try the mask yet, but all the other products do a bang up job , and you don't have to use them all. Just using the Volimizer spray at the roots will make a huge difference, but adding in the shampoo/conditioner combo is even better. One thing that sets the Phyto shampoo apart from many other volumizing types, is that it has ingredients like yarrow to thicken hair. There is a difference between volume and thickness. My very fine haired mom will tell you this as she's been though all the volume giving shampoos out there. ( She loves the Phyto and in fact , happily made off with my stash ). 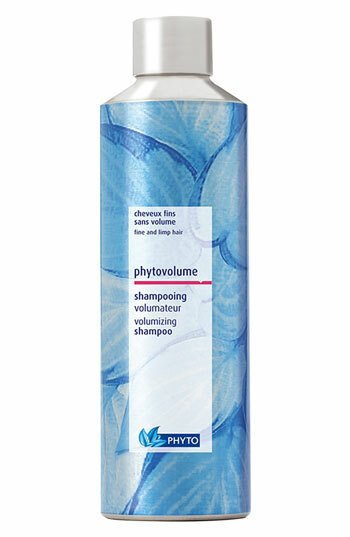 The volume here lasts long which is another bonus and your hair feels conditioned and soft, but not weighed down. I love ,too, that there's a mousse. Mousse was big for years then disappeared. Mousse generally works so I'm happy to see it making a comeback. I am intrigued by , but as I said , didn't try the mask. It's said to regenerate hair with grapeseed and black currant seed oils. And has botanical proteins to thicken hair. I think that's far more moisture than my hair needs, but for fine hair, worth trying. ( the volume line is under "lifeless" hair and "styling"). Phyto is also available at Ulta stores. Two randomly drawn winners will receive a VIP trip for two to NYC valued at $4000, including tickets to see Lady Gaga live from a luxury suite at the world’s most famous arena – Madison Square Garden! In my Spring trend guide for Beautystat , I talked about the Oud trend in fragrance and that it will continue to grow this year. One of new ones is now here, Bond No. 9 New York Oud. This is the 3rd in their Oud collection after Bond No 9 Oud also called Signature and Harrods. This Oud is a different than many. Oud itself is resinous wood that gives off a scent of incense and spice . New York Oud has a touch of the incense, but a small amount , it's more sweet , and has an overall warmth on the skin. Instead there is plum , rose , orange zest, teakwood, vetiver, patchouli and honey. Most prominent here are the rose and honey notes making a scent that will fragrance the winter days still ahead. Think of it as a cozy sweater wrapping itself around you . I think of it as an Oud for those who aren't generally fans , like myself. Pure Ouds don't appeal/work for me, but I am loving New York Oud, and that was surprise. Bond No 9 says it's a modernized Oud and it is. It is also a perfume with 30 % Oud concentration, instead of the usual 20% in most perfumes. 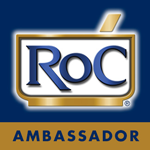 What this means is that you are getting a fragrance that will last long, all through the day. It also has great sillage. Nothing overpowering, but it's there. 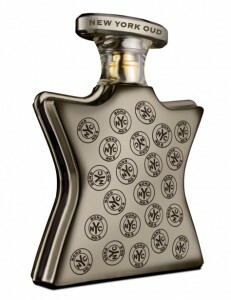 New York Oud is available now for $ 310.00 for 100ml at http://www.bondno9.com/ and Saks locations. Phyto has got a promotion going that all of us, not just those in big cities can take advantage of and it's free. To promote the upcoming release of their new Phytolisse perfect smoothing collection , the company has teamed with Ulta salons nationwide to offer free blowouts featuring their products. Now if you've used Phtyo before, you know it's one of the best brands out there. If you haven't, then this is a chance to try it for yourself. "To celebrate the launch of the new Phytolisse perfect smoothing collection, Phyto is offering complimentary blowouts using the new shampoo and mask with Phyto’s cult anti-frizz products. The new Phytolisse Shampoo and Mask work in conjunction with award-winning Phytodéfrisant Botanical Straightening Balm, and Phytolisse Smoothing Serum. Phyto’s perfect smoothing collection is a unique 4-step system that expedites blowdrying while shielding hair against humidity and frizz for up to 72 hours. In addition to complimentary blowouts, consumers will be treated to a travel-sized gift of Phytodéfrisant and Phytolisse serum minis with the purchase of two Phyto products. (one per customer, while supplies last.) "
Make an appointment today by calling an ULTA store near you. Receive a travel-sized gift of Phytodéfrisant and Phytolisse serum minis with the purchase of two Phyto products on these 2 days. February is Women's Heart Month, an important topic women need to know about . Each year during fashion week there is the Heart Truth show and Bobbi Brown not only does the makeup backstage( for six seasons now) but this season has also created an exclusive, limited-edition Creamy Lip Color Trio in support of The Heart Truth’s efforts to raise awareness about women and heart disease. The set features ( one of my favorites) Creamy Lip Color in three shades – Nectar, Blue Raspberry and Uber Pink. Creamy Lip Color ,if you haven't tried it yet, is super moisturizing with a nice shine to it. A cold weather staple. 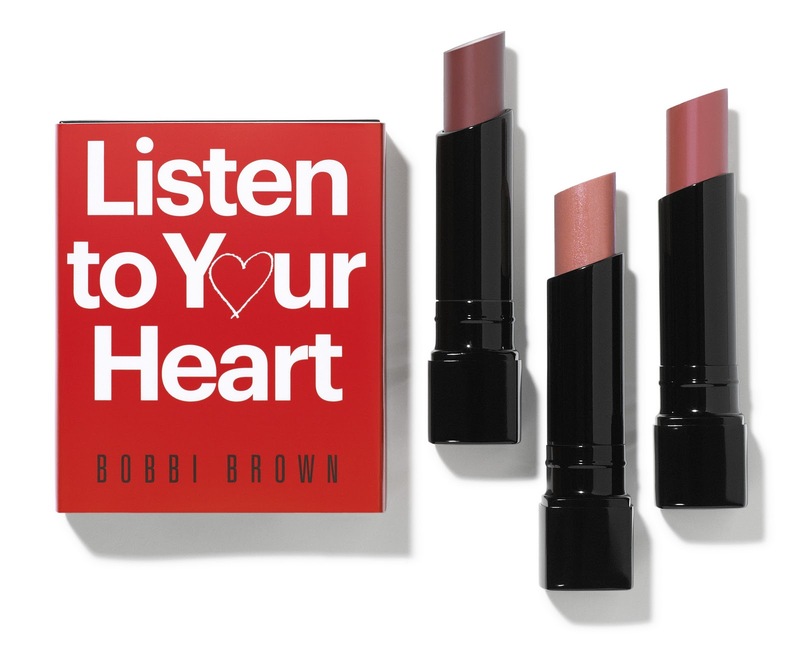 Only 500 pieces of this limited edition set will be available on www.bobbibrown.com for $59. The Heart Truth show will be at Lincoln Center on February 9th and Dita Von Teese and Linda Gray of Dallas fame will be among the walkers . Tone's new body wash features crushed grape , shea butter and vitamin E. This new wash is a cream/ gel , more gel than cream , very moisturizing and smells great. The scent is of grapes but not soda sweet or candy grape, but more a plum or concord one. It's not a strong scent but just pleasant enough. Tone Vino Moisture with Crushed Grape and Shea Butter will be in stores February/March and retail will be $ 3.99 . Not sure what it says that that the day I met Simon and Nick of Duran Duran was one of the best ever, but in my defense it was also my first day ever at fashion week , so put the two together and yes, it goes on the best ever list. I mean, I have been a fan for , ok not saying how long, but you get the idea. LONG. And I told them so, and they were gracious and sweet, bless their hearts. So how excited was I to hear they partnered with my also beloved Dior to do the music for the videos of the new Dior Addict Lipstick? Their new single All You Need Is Now dropped in December and is good. Really good. That song with a mash up of few Duran older gems forms the music for the new video starring Kate Moss along with some fabulous Parisian scenery, one gorgeous Rolls Royce and Dior baubles and shoes. I know nothing else about these new lipsticks, but I do know that I loved the orginal Addict ones. Shade Lunar Brown was and still is an all time fav, even if it too old to use now. So Dior and Duran= sign me up. You can view the two , very short, previews at these links. More info when I get it. In the meantime , enjoy. Philosophy hope in a tinted moisturizer brings a tinted moisturizer into their hope skincare line. Hydrating and loaded with good for your skin ingredients , it's especially suited to this cold winter many of us have been having. 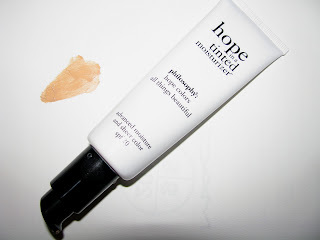 Ingredients in hope in a tinted moisturizer include sodium hyaluronate, a peptide blend, vitamins E, C and Carnosine , mango seed butter, sunflower seed oil, lavender oil, as well as uva and uvb protectors with an SPF of 20. The moisturizer leaves behind a hint of color with light coverage. The pump bottle is a nice touch and the product blends easily and dries fast . It had a barely there feeling on my skin . The shade shown is light, and is a bit darker than the palest skins might need. I am pale but not the palest in foundations and this worked on me but was still a little darker than I would normally use. There are 8 shades in all. If you love tinted moisturizers, then you might want to give this a try. All the added skincare ingredients plus SPF make it a good choice for normal to dry skins who like sheer coverage. St. Ives has brought us some winter weather helpers. Not only are there two new hydrating body washes but also new is this delicious smelling Coconut Milk and Orchid Extract body lotion( full name is actually Advanced Body Moisturizer). With a fragrance of tropical coconut and the light florals of the orchid, you can't help but smile a bit . It's aromatherapeutic . Just what mother nature ordered. This is very moisturizing but light enough to dry fast. No greasy feel. 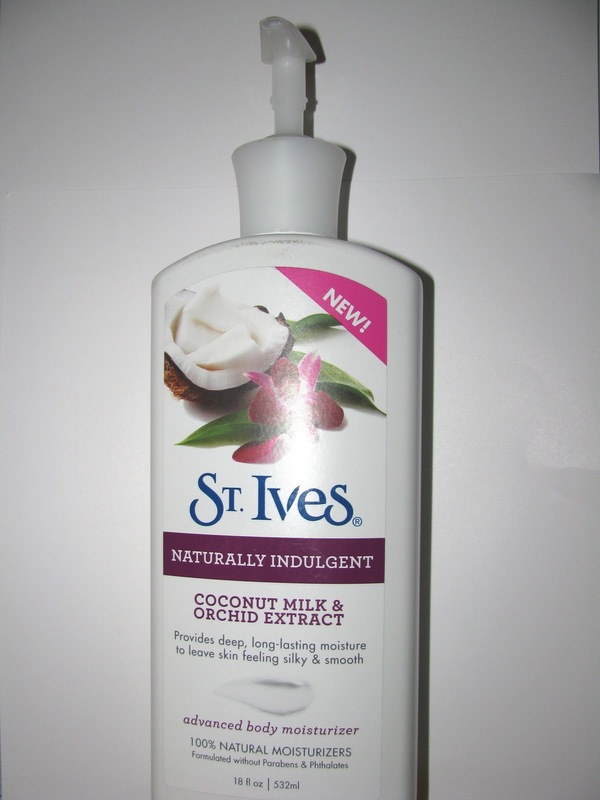 A great daytime lotion as you can get dressed right after applying. Plus you get a hint of that pretty scent. This is a pump bottle lotion and is huge. 18 oz is more than a pound of lotion and at $ 4.99 is a real bargain.